Do you need your own bedding and bath accommodations when you travel? Do you plan to take your kids or grandkids to fun destinations? 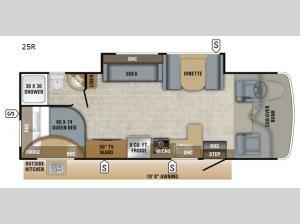 Then start bringing all of those desires to life with this Redhawk class C gas motorhome. Model 25R offers plenty of storage for a weekend or week-long trip, a TV across from the furniture, and an 8 cu. ft. refrigerator to store all of your perishables! When it's time to retire for the evening, the queen bed offers you a good night's rest where ever you go. You also have a full bath, and kitchen amenities to make meals, plus exterior storage for your outdoor items. You can even make meals at the outside kitchen and store extra drinks in the exterior refrigerator. It's time to load up and head out in a Redhawk today! With any Jayco Redhawk class C gas motorhome you will get reliability and value on the open road. From the molded, seamless fiberglass front cap protecting you from the wind and rain, and the JRide package for the ultimate driving experience, to the rear backup camera that feeds directly to your in-cab monitor to help you reverse with more visibility, you will find satisfaction for years to come. There is interior storage throughout including under the queen bed, and an exterior pass-through compartment with a light to keep all your gear organized and ready for each trip. 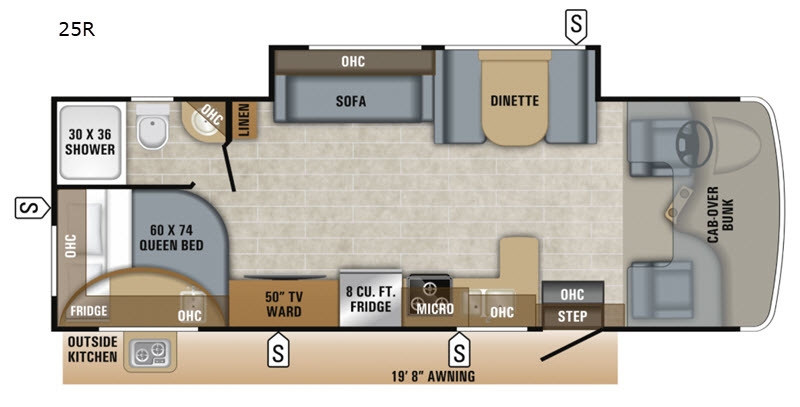 Come see why you should own a Jayco Redhawk motorhome!